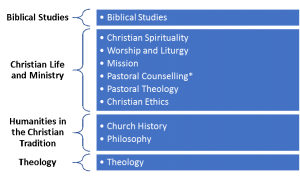 Why undertake a Bachelor of Theology? The Bachelor of Theology is an in-depth course of study that will provide you with the skills to understand the Bible, Christian Thought, and Traditions. It will also provide you will skills in self-reflection, synthesizing theological knowledge, and discernment, and will help you to understand other faiths. This knowledge and understanding is extremely important in the multi-cultural society of today where the media is full of complex international relations and the threat of terrorism. Meet the English Language requirements for entry to the course. If your previous studies were undertaken in another language you’ll need to complete an IELTS test and have a result of 6.0 with no score less than 6.0 in all bands of the test. 3 years full time or up to 9 years part time. The maximum time allowed for the completion of the course is 9 years. Two majors. What is a major? – Six units, consisting of no more than two units at 7100 level, and at least one unit at 7300 level. At least three units must be in the same sub-discipline. At least one of these must be in the disciplines of Biblical Studies or Theology. If you decide to complete a major in biblical studies then you also need to complete at least one unit in Biblical Languages. One Sub-Major. What is a sub-major? – Four units. No more than two 7100 level and at least one 7200 level. At least one of these must be in the disciplines of Biblical Studies or Theology unless these are both of your majors. At least one History Unit. I want to complete more study after my Bachelor of Theology, what should I do? This depends on where you want to go in your career, and what your grades have been like throughout your studies. For students who have achieved a credit average or above throughout their studies it is possible to complete the Bachelor of Theology (Honours), and then if a certain standard is achieved in this and you would like to go deeper into your theological studies you could pursue a Doctoral program. Have a chat with the registrar of your chosen Teaching Body if this is something that you’d like to consider doing.